I'm not exactly sure when it happened, but at some point in the last several years, ginger butternut squash soup became America's #1 vegetarian soup of choice. Ginger butternut squash soup is everywhere. Google it, and you'll get hundreds of recipes (I stopped counting after the eighth full page load). Every vegetarian cookbook has a recipe for it. It's the go-to soup for Thanksgiving holidays and dinner parties, and 9 times out of 10, it's the only vegetarian soup available at cafeterias and supermarkets food courts. I've seen brawls break out in Trader Joe's as people frantically try to scoop up as many cartons of butternut squash soup as possible. I understand the love. I made my first pot of ginger butternut squash soup about 15 years ago from a vegetarian cookbook I bought right after we moved to North Carolina. It was a revelation: creamy, refreshing, soothing. I have made that soup so many times, the recipe is etched in my brain along with my telephone number and birth date. Yet, my love has grown weary. I'm tired of ginger butternut squash soup. I need something bolder, zestier, hotter! So for today's butternut squash soup recipe, I swapped my gentle ginger for assertive chipotle chilis in adobo sauce. Smoky, fiery chipotle chilis are the perfect antidote to boring butternut squash soup. With cilantro, onions, and cumin, this soup has a decidedly southwest flair, so I won't need to tell you that big hunks of warm, buttery cornbread are the only accompaniment it needs. How about you? Doing anything different with butternut squash soup lately? 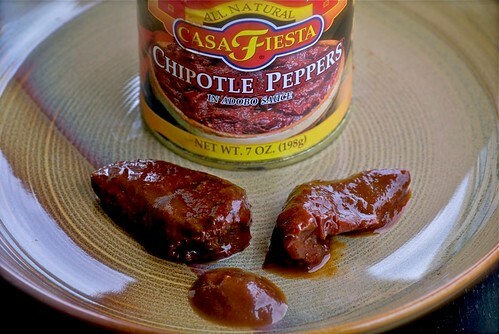 Chipotle chilis in adobo sauce can be found in the Mexican food section of most major supermarkets or at specialty Mexican markets. 1. Position a rack in the center of the oven, and preheat to 400 degrees F. Slice butternut squash in half. Scoop out the seeds and discard. Brush the flesh with a little bit of olive oil. Roast flesh side down on an aluminum foil-lined baking sheet for 40-45 minutes or until tender when pierced with a fork. Let cool slightly before scooping out flesh. Discard skin. 2. In a deep pot over medium-high heat, warm oil. Saute onions, celery and carrots for 5 to 7 minutes, or until softened and lightly browned. Add the cooked squash and broth. Bring to a boil, then reduce to low, and cook for 5 to 7 minutes. Add chilis, cumin, and cilantro. Turn off heat, and let cool 10 minutes before pureeing. Taste it. If you’d like it spicier, then add more chilis. 3. Working in batches, puree the soup in a blender until smooth, and return to the pot over low heat. Stir occasionally until the soup is thoroughly heated, about 10 minutes. If you prefer it thinner, then add a bit more broth or warm water, and stir well. Season with salt and pepper as desired. Garnish individual servings with fresh cilantro, if desired. Sweet Chipotle Glazed Baby Back Ribs recipe from Sippity Sup! Oh yum, that looks good and warming. Unfortunatly, chipotle chilis aren't that easy to come by in the UK. LOVE this soup, Susan. I've found that I much prefer "sweeter" vegetables like butternut squash, or even sweet potatoes, with spice/peppers. Plus, I can't say no to chipotles. I would have never thought to put them together, but it tastes good just looking at it! Wonderful combo. I'm totally in agreement with you! I love a good bnut squash soup but sometimes you just want something different! Loving the heat in this. It's the perfect compliment to squash! Thanks for sharing one of my Soup Chick recipes. I adore chipotle chiles, and find their smoky heat slightly addictive (in a good way). Love the sound of this soup. I'm bookmarking. sylvie-Really? That's too bad. It reinforces the stereotype of British food being bland. elly-I too am weak to chipotle's charms. joanne-It's all about striking the right balance. lydia-I actually thought of you when I was creating this recipe. I know you're a chipotle lover too. I adore just about all butternut squash soup, and ginger is such a natural compliment. 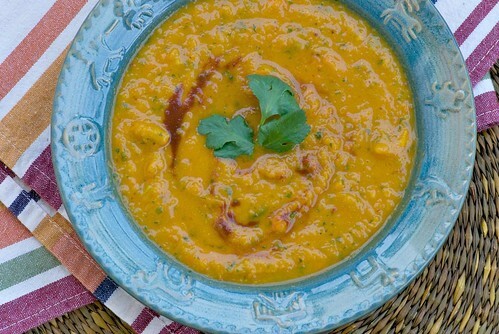 But I have to say my favorite is a Spicy Peanut Squash Soup on my blog. It's nothing short of addicting! I don't have chipotles, but I was wondering if I could use the sriarcha sauce I have in my fridge?? Love the heat here - and you can freeze leftover canned chipotles - they look kind of nasty, but thaw just fine to use in soups. This looks amazing - I've been yearning for butternut squash soup and my husband loves it. I love the chipotle twist - very unique! Will definitely make this. cara-Oh, yes! I couldn't agree more. I have a spicy peanut sweet potato soup that I adore. anonymous-I've never tried it, but I suppose you could. It's less smoky than chipotles, but it would add heat and spice. Let me know how it comes if you do it. liz-Thanks for that tip! Sometimes they go bad in the fridge cause it's hard to use them all up. auria-Wonderful! It's a win-win for you and him. Thanks. Now that's a butternut squash soup my husband could like. He's not a fan of butternut squash unless it has some heat from chiles! This looks amazing. Another thing this will help keep us warm this winter. andrea-Hey, if it gets him to eat his veggies, go for it! jeff-And it's tastier than a fleece jacket. Oh, I love the thought of adding some chipotle chilis to butternut squash soup. Great idea! My twist this year on butternut squash soup was a hearty splash of brandy. It really changes the flavor and is yummy. Ok I am making this tomorrow! Chipotle is a Texas staple. I can't wait. Such a great idea. Wow, this looks and sounds divine. Bring on the heat! lara-I hope it you enjoyed it! That looks great. I just made for the first time ever a chili with butternut squash so now I'm hooked. Will have to try this recipe. I love spice! Come by my blog and share this in our Super Bowl of Soup Challenge if you're interested! Your blog is amazing..Thanks for sharing your recipe..i will try to make it this night..